The Big Small Show, an annual Drawing Rooms exhibit, is a survey of works made in the past two years by artists living in the NY metro area. Works by more than 100 artists will be on display until February 17, 2018. Curator Anne Trauben selected 5 of Barbara Lubliner's monoprints. Drawing Rooms is a Jersey art center housed in a converted convent. The intimate setting of multiple rooms creates a place where art and artists connect with the public and with one another. Visit the Drawing Rooms website for more information. To celebrate the arrival of the holiday season, the Trask Gallery will overflow with a special exhibition and book sale benefiting The National Arts Club Adopt-A-Masterpiece program. Exhibition curator Dee Shapiro is delighted to have such a great group of artists deck the walls of the Trask Gallery. 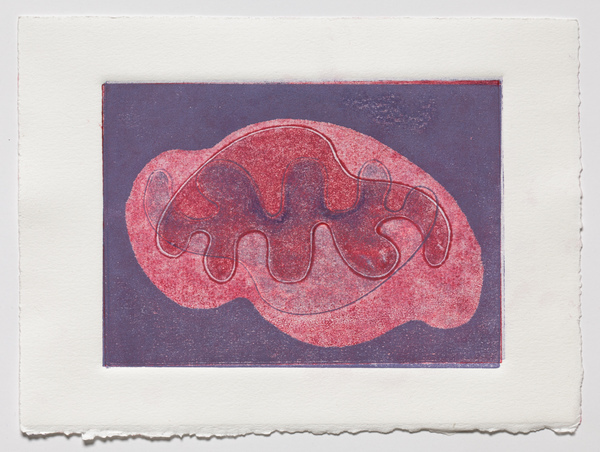 Two of Barbara Lubliner's new monoprints are part of the mix. "Have a Nice Day 1," detail of Barbara Lubliner's 3-part selfie. ME, MY SELFIE AND I / Contemporary Self-Portraits curated by Rick Krieger and Jim Furlong includes a dazzling collection of a wide variety of work by over 80 artists. Bosom Bodies: An Exhibition in Honor of Breast Cancer Awareness Month, presented by The New York Arts Exchange, features the work of 16 artists. The exhibit celebrates the beauty, power and sensuality of the female breast through a wide range of artworks, including paintings, sculpture, photography, origami, and mixed media. Curator Beth S. Gersh-Nesic includes four of Barbara Lubliner's feminist figurative sculptures in the mix. Roni Ben-Ari, Lynn H. Butler, Marcy B. Freedman, Kathleen Gilje, Nadine Gordon-Taylor, Wilhelmina Obatola Grant, Grace Graupe-Pillard, Clarity Haynes, Carla Rae Johnson, Barbara Lubliner, Sasha [Alexandru] Meret, Ioana Niculescu-Aron, Toni Quest, Ruby Silvious, Christina Thomas and Tricia Wright. Barbara Lubliner performs as Ms. Muscle October 1st at the Dada de Dada celebration of the 50th anniversary of the Avant Garde Festival held on the Staten Island Ferry in 1967. The Annual Avant Garde Festival of New York was an event founded and produced by performance artist Charlotte Moorman. The festivals ran for 15 years in various locations. The 5th festival was a 24 hour event, September 29 - 30, 1967 on the John F. Kennedy Staten Island Ferry boat. Day de Dada Performance Art Collective wishes to bring recognition to that event which brought art to ferry commuters and tourists 50 years ago. The Après Avant Garde Festival will have elements of the original festival - dance, music, video and interactive performance. Festivities start at 1 pm at Borough Hall Park in Staten Island. Performances will take place at both Ferry Terminals and on the ferry. Go to the event page for times and locations. Performance Art on the Farm 2017 “IN TIMES LIKE THESE” presented by Collaborative Concepts and curated by Marcy B. Freedman features six projects including Wish Sisters at the Wishing Well. In their performance the Day de Dada Wish Sisters examine the nature of contemporary hopes and dreams as they sit around their virtual well. Visitors to the farm are invited to toss a coin into the well to make their own wish, hear wishes collected from around the world and listen to fables about wishing. Wish Sisters include: Milenka Berengolc, Mary Campbell, Lydia Grey, Barbara Lubliner, Viv de Dada, and two Wish Brothers, Larry Schwabacher and Mark Semanchik. Performance Art on the Farm coincides with the opening day of Collaborative Concepts Saunders Farm Project sculpture exhibit. "Muscle" by Barbara Lubliner at the Ms. Foundation next to Daniel Bagan's photograph of Gloria Steinem and Dorothy Pitman Hughes taken when they were 79 and 82 years old. An Aggregate of Forces: 60 Women Artists Over 60, Joanne Mattera's blog post celebrating older women artists includes the image of my "Muscle" sculpture in situ at the Ms. Foundation. I'm delighted to have my work in the prologue of this inspiring celebration of women artists hitting their prime! Carter Burden Gallery presents three new exhibitions including Barbara Lubliner's installation, Upcycled Tubes: Assert, Defend, Surrender and Youngsters in the "On the Wall" space at the entrance to the gallery. The Body language figures are made of tubes that Lubliner collected last summer from the sewing room at the Carter Burden/Leonard Covello Senior Program in East Harlem, while she was artist-in-residence. Also on display is Summer in the City showcasing recent work of 14 gallery artists and Ellen Wallenstein's East Harlem Diptychs. The Day de Dada Performance Art Collective including Ms. Muscle (Barbara Lubliner) will perform at EVEnt, an exhibition curated by Karmela Berg in which ten artists express diverse points of view about being women in the 21st century. I am please to have two monoprints in Duality: Glimpses of the Other Side, a group show curated by Scott Bluedorn at the Islip Art Museum. Reflecting duality through art showcases the wit and playfulness of the mind. "Mother and Child" sculpture awarded at Moms-In-Film One-Year Anniversary Celebration! I am so pleased to have my sculpture awarded to the amazing Marielle Heller by the amazing Moms-in-Film! Moms-in-Film, an organization founded to energize the careers of mothers in film and television by providing community, funding and advocacy, celebrated its one-year anniversary at The Players on April 18. The bi-coastal organization chose to honor filmmaker and mother Marielle Heller, whose film DIARY OF A TEENAGE GIRL ignited audiences and critics alike at Sundance and Berlin, and whose upcoming film CAN YOU EVER FORGIVE ME? stars Melissa McCarthy. Accepting the award, Heller commented, “"Before I had a kid, I thought I'd have to keep those parts of my life separate. I didn't think, as a mother, they'd take me seriously as a filmmaker. I had my child 5 weeks before my film premiere and there was no separation, he was there, breastfeeding at my premiere party. I realized how much I didn't want those things separated... It does feel like our personal feminist fight right now." The award itself is a concrete sculpture titled MOTHER AND CHILD by Barbara Lubliner whose work, often inspired by her experience giving birth and mothering, can be seen on the Brooklyn Museum Feminist Art Base. OFF THE WALLS, a recycled/repurposed materials exhibit curated by Willie Cole features artwork made of a wide array of materials inventively used. Included is Barbara Lubliner's "Wall Rug," made of plastic dry cleaner bags worked like a traditional fabric braided rug. For Women's History Month, sculptor Barbara Lubliner will give an illustrated talk and hands-on sculpture workshop at the Mulberry Street branch of the New York Public Library. She will share about figurative sculptors that have inspired her, giving highlights of historic, famous, as well as some little known women sculptors. The Day de Dada Performance Art Collective has been producing events that include experimental and interactive performance art, installations, video, film, music and noise since 2002. Day de Dada Props & Costumes is a look at the group's history through props and performance documentation. The exhibit features Barbara Lubliner's "Breast Muscles," which she has worn at three Day de Dada events. Participating artists: Viv Vassar, Mary Campbell, Milenka Berengolc, Margaret Chase, Barbara Lubliner, Tamara Wyndham, Mark Semanchik, Phil Sanders, Larry Schwabacher, Lydia Grey, Jennifer Wiegel, Gary and Joan Moore. Also included are images of these artists performing: Helen Levin, Leslie Lowe, Alan Moore, and Jean and Jim Jeffers. Women Under Siege / It's Happening Right Here, an exhibition curated by artist Susan Grabel addresses the sexism and misogyny contained in laws across the country being used against women. Grabel invited artists to create an artwork in response to a woman's story that illuminates the issues. In Barbara Lubliner's piece, "Private Choice Public Fight," the artist imagines the internal struggle involved at a vulnerable and critical time.